Indie Retro News: Gimmick! 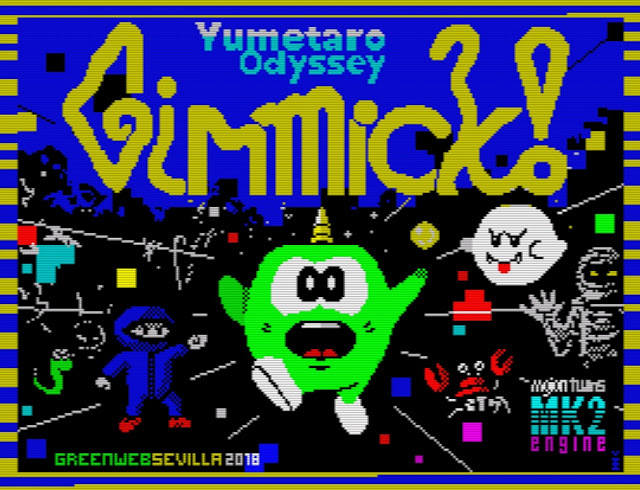 Yumetaro Odyssey - Eagerly awaited ZX Spectrum game gets a release and a review! Gimmick! Yumetaro Odyssey - Eagerly awaited ZX Spectrum game gets a release and a review! The ZX-DEV Conversions compo has been a huge success this year with some amazing games from some very talented people, which doesn't just include the coding of the game, but music as well as other bits added to make them a little bit more special. One such game we have been eagerly awaiting is ' Gimmick! 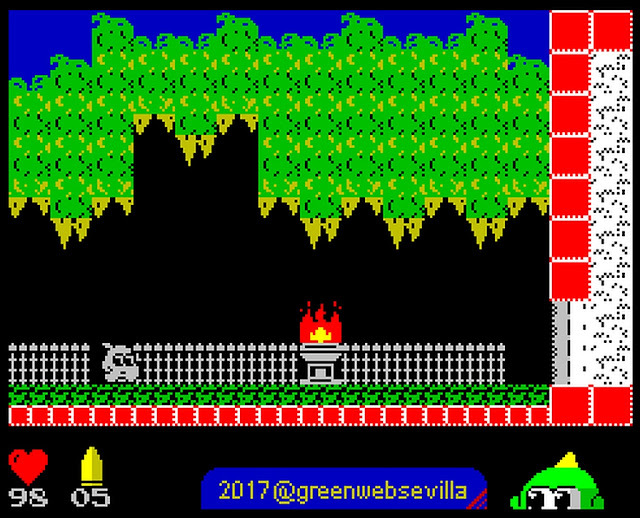 Yumetaro Odyssey' by GreenWebSevilla, which caught my eye some time ago as not only is it based on the 1992 Famicom/NES game Gimmick! published by Sunsoft, but each level is inspired by other classic games such as Sonic, Super Mario Bros, Castlevania and more! Well as of right now you'll be pleased to learn the game this lovely looking game by Antonio Perez, with screens by Igor Errazkin is finally out, and has been developed using The Mojon Twins MK2 engine, as a side-view platformer with many levels connected to a main level, exactly like Wonder Boy Dragon's Trap (Master System). So basically walking through a main door in the town and you'll be thrust into another themed world such as the first level which is very much inspired by Super Mario! So what do I think of the game in my short play through during this afternoon? Well this game is mighty impressive even from the very beginning. To have such themed levels from other games of our nostalgic past, with music to match is pretty damn impressive. I was taken back to another golden era as I entered one of the buildings and my instant throw back was to that of Super Mario, with not just big blocks of question marks but enemy mushrooms moving back and forth as if they were listening to the ZX Spectrum soundtrack version of the same name. I couldn't fault Gimmick! Yumetaro Odyssey at all, the animations are lovely, the graphics of the levels are eye candy to ZX Spectrum owners, and what's more the controls are smooth and will make you chuckle as you jump and your little guy opens his mouth. Seriously a game not to be missed and one I'd love to see as a commercial tape release!